Remember back when Vince Vaughn was a big movie star? Those days seem like they occurred a long time ago. 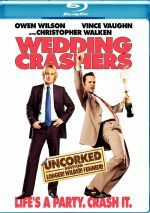 Vaughn peaked commercially with 2005’s Wedding Crashers but he still mustered decent success as recently as 2009’s Couples Retreat. Since then, however, Vaughn has starred in one box office dud after another, and he appears to have hit rock-bottom with 2015’s Unfinished Business. That release took in a pathetic $13 million worldwide – I didn’t think it was possible for a major studio release with a star involved to fare so poorly. Despite the movie’s weak commercial performance and brutal reviews, I thought Business deserved a look. With a cast led by Vaughn, Dave Franco and Tom Wilkinson, I figured it merited some attention. When Dan Trunkman (Vaughn) gets into a tiff about money with his boss Chuck Portnoy (Sienna Miller), he leaves his job at Dynamic Progressive Systems. He decides to start his own mineral sales firm that will compete with Dynamic. Dan’s Jerry Maguire moment doesn’t go as well as he hoped, so none of his colleagues quit with him. He manages only two employees: Timothy McWinters (Wilkinson), a guy who lost his gig at Dynamic due to his advanced age, and Mike Pancake (Franco), a neophyte who interviewed at Dynamic but couldn’t land employment. Perhaps it’s the low expectations that comes with the movie’s 11 percent Rotten Tomatoes rating, but I think Business comes with some entertainment value. Does this mean I find it to offer a great – or even good – flick? No – it definitely sputters more often than I’d like and it lacks consistency, but occasional amusement arises. Much of the fun comes from Franco’s naïve, innocent take on Mike. As written, the character should come across like a moron, but Franco gives him such a gentle charm that he’s likable and amusing. Franco carries the movie for long stretches. Other aspects of the film entertain as well. When allowed his comedic moments, Vaughn prospers, and Wilkinson does fine in his role despite its underwritten nature. Miller may impress the most; not someone I view as a comedian, she adds real zest to her cliché role as Dan’s rival. The actors manage to bring out much of the movie’s comedy. Which they need to do because of the film’s flaws, most of which revolve around the messy narrative. Business can’t decide if it wants to be a warm and fuzzy story about an earnest, dedicated family man or a debauched comedy. This means Business straddles those lines in a manner that creates inconsistency. When the movie saddles us with aspects of Dan’s home life – his stressed-out wife, his picked-on obese teen son and his angry young daughter – it collapses. Indeed, these subplots occasionally make the film feel like a PSA about bullying. I guess the filmmakers think these elements add heart to the tale, but they just don’t work and they distract from the movie’s positives. All of which stem from the broad comedic moments. As a “debauched comedy”, Business can feel tame. Even its most outrageous moments – like those in a seedy gay club – don’t seem especially “out there”. While the movie clearly earns its “R” rating, it doesn’t push any envelopes. Nonetheless, the comedic scenarios at least bring us pretty good amusement. As noted, the actors contribute a lot to this, as they do just enough to milk the scenes for their potential. When we shift from Dan’s family of Afternoon Special rejects, the film works fairly well. Unfortunately, we spend way too much time with the Trunkmans for Unfinished Business to become more than an occasional success, and even at a brief 91 minutes, the movie can feel long. Still, the flick entertains more than it doesn’t, so I enjoyed much of my time with it. 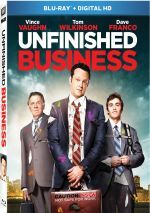 Unfinished Business appears in an aspect ratio of approximately 2.40:1 on this Blu-ray Disc. Though not stellar, this was a mostly positive presentation. Colors tended to be a little muted and slightly stylized, but not to the extreme one often gets from modern movies. The flick went with a light teal/orange orientation, but nothing extreme. Overall, the hues seemed positive. Blacks appeared firm and deep, while low-light shots demonstrated nice clarity. The image seemed satisfactory. As for the film’s DTS-HD MA 5.1 soundtrack, it offered a decent effort and not much more. Of course, I didn’t expect a dazzling soundfield from this sort of comedy, and I got mostly what I anticipated. In terms of effects, general ambience ruled the day, though a few sequences added a little pizzazz. Audio quality appeared fine. Dialogue was consistently warm and natural, and speech displayed no concerns related to edginess or intelligibility. Effects were a minor component of the mix, and they seemed appropriately subdued and accurate; there wasn’t much to hear, but the various elements were clean and distinct. The music came across as acceptably distinctive. This was a standard “comedy mix” and became a good reproduction of the material. Only a few extras fill out the set. Show Me Your Business goes for five minutes, 44 seconds and includes comments from actors Vince Vaughn, Dave Franco, Tom Wilkinson, James Marsden, Sienna Miller, and Nick Frost. “Show” covers cast and performances as well as story and characters. This never becomes more than a glorified promotional piece. 16 Deleted and Alternate Scenes run a total of 30 minutes, 59 seconds. Cut footage often expands secondary characters, and that proves true here. We get more from a mix of supporting personalities, and these moments offer some decent material. We also find some different versions of segments found in the final flick. These vary in quality but usually seem interesting to view – even if a lot of them show Dan’s boring family. We also get a Gallery. This offers 11 promotional photos. It’s pretty dull. The disc opens with ads for Spy, Kingsman: The Secret Service and X-Men: Days of Future Past – The Rogue Cut. Sneak Peeks tosses in promos for Taken 3, The Marine 4: Moving Target and She’s Funny That Way. We find the trailer for Business as well. Though it can drag and lacks consistency, Unfinished Business still musters reasonable amusement. Nothing about it shines but it comes with enough comedy to make it watchable. The Blu-ray provides pretty good picture and audio along with supplements highlighted by an extensive collection of deleted footage. Don’t expect greatness from Business and you’ll likely find it to be engaging enough.